The announcement yesterday that NASA’s Spitzer Space Telescope had revealed the first known system of seven Earth-size planets around a single star may be the biggest news of the year for the space agency. But it wasn’t only big news at NASA’s headquarters in Washington, D.C., where a press conference was held Wednesday afternoon to publicize the achievement. Physics professor Adam Burgasser and his team at UC San Diego’s Center for Astrophysics and Space Sciences played a contributing role in the discovery, which was detailed in a scientific paper published today in the journal Nature. The UC San Diego team has been studying the tiny star around which the seven Earth-sized planets orbit to determine its temperature, surface gravity (a measure of mass and radius) and elemental composition. The team also obtained measurements of radio emission of the star to determine its magnetic activity, important for assessing the habitability of its seven planets. Three of the planets are located in an area around the star astronomers call the “habitable zone,” where the surface temperatures of rocky planets are just right for liquid water, a critical ingredient for life as we know it. In addition, the discovery of this planetary system—named TRAPPIST-1—set new records for the greatest number of both Earth-sized planets and habitable zone planets found around a single star outside our solar system. “This discovery provides critical insight for astronomers of where to look for more planets outside of our solar system in habitable regions, with the goal of understanding the range of environments in our universe that could potentially sustain life,” said Steven Boggs, an astrophysicist and dean of UC San Diego’s Division of Physical Sciences. Last May, Burgasser was part of a team of astrophysicists that announced the discovery of three Earth-sized planets around this dim, dwarf star, which is located some 235 trillion miles from Earth in the constellation Aquarius. The discovery was based on data obtained with The Transiting Planets and Planetesimals Small Telescope (TRAPPIST) in Chile. The planets were found by measuring the slight dimming of starlight that occurs when the planets pass in front of—or transit—the star, much like watching fireflies buzzing in front of a faint light bulb. Following that initial discovery, the international team last fall took a closer look at the TRAPPIST-1 system with a full 20-day stare using the Spitzer Space Telescope, an infrared space telescope ideally suited to observe the cool star, which radiates strongly in infrared wavelengths. The team also used powerful ground-based telescopes, such as the UK InfraRed Telescope (UKIRT) in Hawaii, European Southern Observatory's Very Large Telescope in Chile and a new TRAPPIST telescope installed in Morocco. Burgasser’s primary role on this international team has been the characterization of very low mass stars targeted for this project, including TRAPPIST-1 itself. He headed a group of research scientists, graduate students and undergraduate students at UC San Diego that studied the dim star using the Keck Observatory and NASA Infrared Telescope Facility, both on Mauna Kea, Hawaii; the Nickel Observatory on Mt. Hamilton, California; and the Very Large Array radio telescope in Socorro, New Mexico. His team determined that TRAPPIST-1 is one of the smallest known stars, only slightly wider than the planet Jupiter. “It’s 12 times less massive and nine times smaller than the Sun, and its surface temperature is less than half that of the Sun,” said Burgasser. By determining the mass, size and brightness of the dim star, Burgasser and others were able to deduce the sizes and surface temperatures of the seven Earth-sized planets, and estimate masses for six of them. The mass of the seventh and farthest exoplanet, which some scientists speculate could be an icy, “snowball-like” world, has not been determined. Combining the masses and radii, the team reported in its Nature paper that it found densities that are consistent with rocky bodies. Further observations of the planets will not only help determine whether they are rich in water, but also possibly reveal whether any could have liquid water on their surfaces. The TRAPPIST-1 star, which astronomers classify as an “ultra-cool, dwarf star,” is so cool that liquid water can only exist on the surfaces of planets orbiting very close to it. All seven of the TRAPPIST-1 planets orbit closer to their host star than Mercury orbits the Sun—another unusual feature of this planetary system. 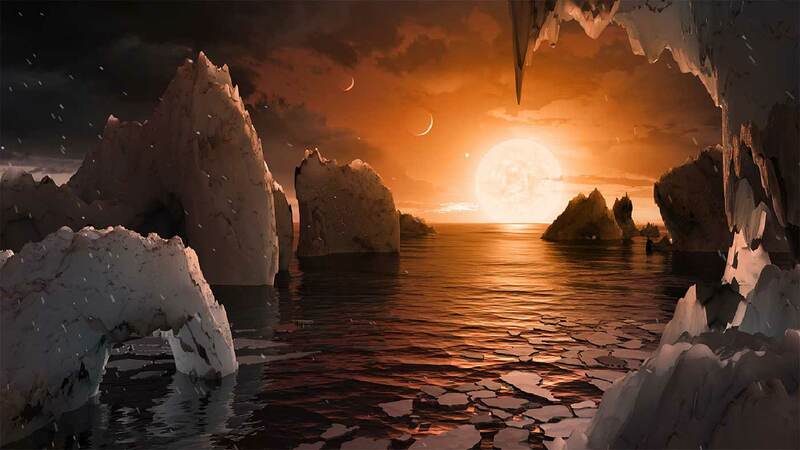 In addition, the TRAPPIST-1 planets are so close to each other that if a person was standing on the surface of one of the planets, he or she could gaze up and potentially see geological features or clouds on neighboring worlds, which would sometimes appear larger than the moon in Earth's sky. “In terms of scale, the TRAPPIST-1 system looks a lot more like the Galilean moon system around Jupiter than the planetary system around the Sun,” explained Burgasser. While the sizes and orbits of the TRAPPIST-1 worlds make three of them potentially habitable worlds, other factors also play a role. 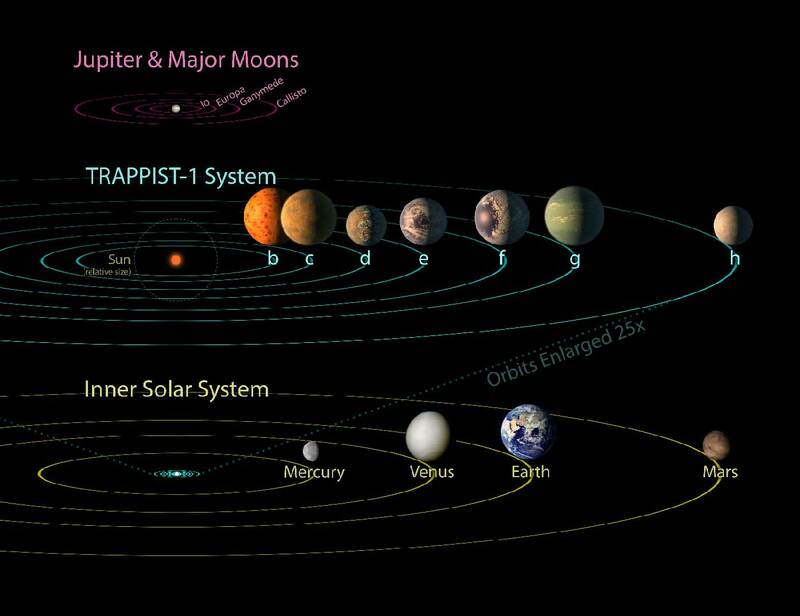 Having planets as close to a star as TRAPPIST-1’s planets are can raise other problems for habitability, he added, including the likelihood that the planets are “tidally locked,” facing the same side to their star just as the Moon always faces one side to Earth. 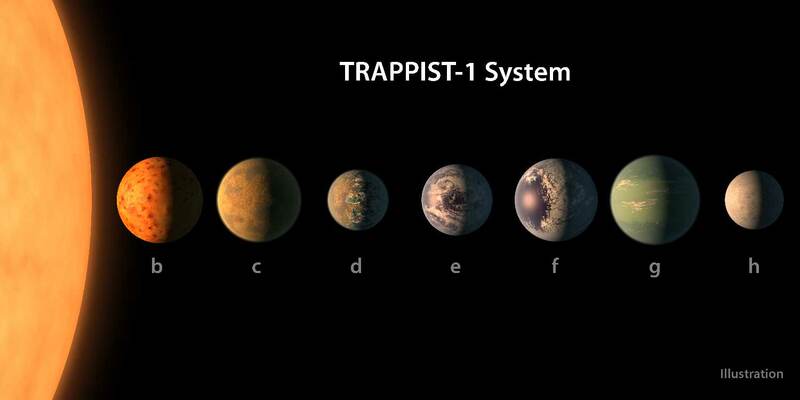 Despite those seemingly strange planetary features (at least to earthlings), the discovery of TRAPPIST-1 has now provided a better roadmap of where to look for more habitable worlds outside our solar system.